Is the sun getting brighter? Through internal nuclear reactions, hydrogen atoms inside the Sun are converted into helium atoms all the time. 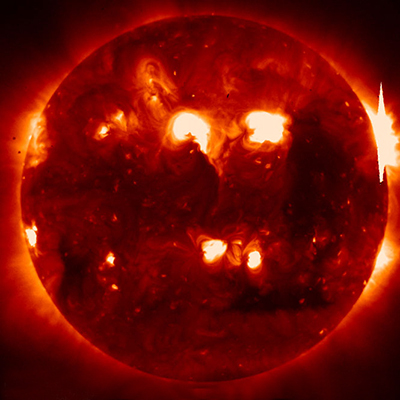 Over time, this causes a change in the composition of the core, causing the Sun to grow brighter. This is not something we would notice from day to day. The sun grows brighter each day, but the rate is very slow. So we wouldn't notice it. But this raises a problem if the Earth is 3.8 billion years old. The Sun would have been 25% dimmer then. And the Earth would simply not receive enough energy to sustain life, at the time when life is supposed to have appeared on Earth. Lawrence, Debbie, and Richard Lawrence. Our Universe. Petersburg, KY: Answers in Genesis, 2008. Print.